An Art Gallery Registrar works full-time in an art gallery tracking the gallery’s inventory and dealing with international shipping and customs procedures for the gallery’s works of art. To work in an art gallery in an administrative capacity usually requires a Bachelor's degree as that type of education provides one with the basic skills of communication and business management. 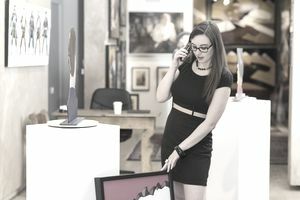 An Art Gallery Registrar’s main duties include managing international transportation and customs procedures as artworks will be shipped to temporary exhibitions such as overseas art fairs. Being knowledgeable in international fine art shipping and domestic and international customs procedures is necessary for this position. Preparing works for gallery exhibitions and art fairs and dealing with collectors are other job duties. An Art Gallery Registrar manages the gallery’s inventory, writes condition reports, follows up on the location of works, and communicates with shippers, art handlers, suppliers, storage handlers and customs officers. Maintaining the art gallery’s computer database to track location and sales information is important. Managing the calendar and gallery schedule for viewings, meetings, shipping, and exhibition installation and de-installation are common duties for this position. An Art Gallery Registrar has had previous experience working in art shipping, or in an art gallery or auction house. Skills include the ability to multitask and knowledge of computer software such as a database for a gallery and how to manage the paperwork to ship works overseas. Image plays an important role in the business of operating an art gallery, as a gallery entices potential collectors to buy artwork. Presenting yourself professionally and in a similar manner to the gallery staff will help you to be seriously considered for the position of an Art Gallery Registrar. Visiting the art gallery beforehand can help you understand how to present yourself when applying for a job. Qualified applicants usually submit their cover letters and resumes to the gallery for consideration.